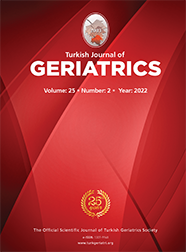 Dr. Lütfi Kırdar Kartal Eğitim ve Araştırma Hastanesi I. Anestezi ve Renimasyon Kliniği, İstanbul In this study, we aimed to compare the effects of desflurane or sevoflurane anesthesia on postoperative recovery in geriatric patients. Forty ASA I-III geriatric patients undergoing elective urologic surgery were randomly assigned to two groups equal in number. Anesthesia was induced with the use of 1 mg/kg fentanyl, 2 mg/kg thiopental, and 0.1 mg/kg vecuronium. Maintenance of anesthesia was obtained in with 3% desflurane in one group, and with 2 % sevoflurane in the other. Both groups received remifentanil infusion at 0.25 mg/kg/min from the onset of surgical incision. Systolic, diastolic, and the mean arterial pressures, heart rate, and peripheral oxygen saturation were monitored during anesthesia. Durations of the awakening times and extubation times were recorded and postanesthetic recovery scores were calculated in both groups. There were no statistical significant differences recording demographic characteristics between the groups(p>0.05). Durations of the extubation and awakening times and recovery scores did not differ significantly(p>0.05). We concluded that both drugs provided hemodynamic stability and early recovery in geriatric patients. Keywords : Anaesthesia, Recovery time, Desflurane, Sevoflurane.